Patrick Tyre and his horse Bucky are both a bit saddle-weary, but you can’t blame them. After all, it isn’t every day that a man and his horse trek halfway across the country — more than 1,200 miles — from Texas to the California coast. The two vagabonds are currently enjoying some much-needed rest with the Carey family at Rancho Ballena Thoroughbreds in Ramona, a breeding, training and rehabilitation facility for thoroughbred racehorses. The journey actually began as a fundraiser more than 20 years ago when Patrick, a general contractor from Shelbyville, Del., and his horse Rocky, a Walkaloosa (a Tennessee Walker crossed with an Appaloosa), set out to cross the country from nearby Bethany Beach to California to raise funds for flood victims in Mississippi. Patrick’s brother Jeff joined them with a support vehicle, and they called themselves The Riders Across America. The US Young Rider World Championship Selection Trials went quite well. All very nice looking rider/horse combinations supported by amazing crews, trainers, friends, family, and owners. 9 horses were evaluated today. Rankings will be published in a couple of weeks. It was very warm and humid on Friday, April 19th in Jasper, Florida. 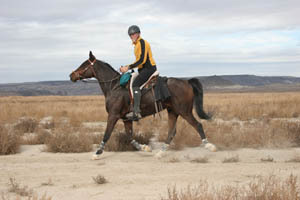 Horses were asked to average a speed of 19 KPH on the first two loops, and average at a speed of 17 KPH on the last loop. The trial was 80 KM's. First loop was 32 KM followed by a 40 minute hold, second loop was 32 KM followed by 40 minute hold, and final and third loop was 16KM, which equates to completing 50 miles at a speed of about 11.4 MPH overall. A Hoof Clinic will be held by Christoph Schork of Global Endurance Training Center at the Adequan AERC National Endurance Championship at City of Rocks. The Clinic is sponsored by Global Endurance Center, EasyCare, Equiflex and Vettec. Vettec will sponsor refreshments during the clinic, and all sponsors have provided give away prizes for a drawing afterwards. Join us for Tevis Talks this Saturday, April 13th at the Auburn Fairgrounds. Tevis Cup Winner and World Champion, Becky Hart will be sharing her insights, stories, and wisdom with us. There will be a spaghetti dinner served and no host bar. Don't miss out on all the fun! Becky has been involved in endurance racing since 1974. Since then she has moved up through the ranks and become one of the most successful competitors in the world. While best well known for her many successes with RO Grand Sultan (Rio), Becky has ridden over 31 horses in competition, won races on 12 of them and top tenned on 25. With over 21,000 miles of competition, Becky has won both the prestigious Tevis Cup and Race of Champions rides twice. She has twice been AERC National Champion and North American Champion. Becky is the only rider to have won the FEI World Endurance Championship three consecutive times. Starting at age six with lessons, Becky lost no time in learning the many aspects of horsemanship. A wide range of experience came from being a Pony Club member and competitor in English and Western pleasure, equitation, trail, saddle seat and jumping, and student at Potomac Horse Center in Maryland. Becky is a level three Centered Riding ® instructor. In addition to Centered Riding, she teaches natural style riding and ground work. Becky has been teaching riding for over 20 years. She incorporates her knowledge of a variety of disciplines to provide a safe, balanced way of riding. This year Becky will be teaching clinics across the United States, Canada and Switzerland. In addition to teaching and riding, Becky has served on the AERC Board of Directors, USEF Board of Trustees, is an FEI 3-star judge and has coached and taught world nominated endurance riders for USEF. She was the Chef d’Equipe for the United States Endurance Team from 2008 to 2010. She is the manager the Shine and Shine Only Endurance Rides. Lexington, KY - The United States Equestrian Federation does not certify, endorse, nor approve specific equine nutritional supplements as safe for use during recognized competitions. As a service to USEF Members, and upon request, the USEF Drug and Medication Program office will review product labels to determine if forbidden substances are amongst the specific ingredients listed. However, all competitors are advised that the manufacture of equine nutritional supplements is not currently subject to formal regulation by any government agency; therefore the proportions, source, and quality of their ingredients may not be consistently controlled during the production process and may be highly variable from manufacturer to manufacturer. In the unfortunate event that a forbidden substance is present in a sample collected by the USEF Drug & Medications testing program, the owner and trainer will be subject to the provisions outlined in GR404 and GR406 and will be held accountable as defined in Chapter 4 of the USEF Rule Book. Rutland — A popular Disney/Touchstone movie, titled “Hidalgo”—directed by Joe Johnston, starring Viggo Mortensen, and written by Vermonter John Fusco—has had a number of western, and Vermont, history scholars in a tizzy ever since its 2004 release. The “based on a true story” movie, now available on DVD for home viewing, tells the amazing tale of U.S. Cavalry dispatcher, Buffalo hunter, and stunt rider Frank T. Hopkins, and a mustang named Hidalgo. Hopkins claimed to have competed in (and won) over 400 endurance horse races, including the 1890 “Ocean of Fire” race—a 3,000-mile ride from Aden to Syria across the Arabian Desert—depicted in the Disney movie. But Hopkins, it turns out, may have been among the biggest wild west story tellers to ever warm his saddle sores beside a trailside campfire.